Perfectly Pink Tea with Mrs. Claus!! This past Sunday, Ballantyne Hotel and Lodge’s main ballroom glistened in pink as precious little girls came together to celebrate one special little angel, Miss Ellie Potvin. My breath was literally taken away at the beauty the room projected. So many incredible professionals came together without question to help kick off the Lift Up Foundation’s first fundraiser…all through the Perfectly Pink Tea with Mrs. Claus event. And my-oh-my…what a gift we all received through this magical time together. The gift of “giving!” Is there anything better?!?! First and foremost, I am so thankful that The Lord allowed Amy Potvin’s path and mine to cross again. This all started when we both simultaneously emailed Kelly Randazzo, the Director of Catering at BH&L. I was trying to schedule a long overdue lunch meeting, while Amy was scheduling a meeting to discuss the event…at the very same time on the very same day. FATE!! Of course, once I discovered their meeting I instantly emailed back…”Can I help?! !” I received a delightful, “Yes!” My role (alongside of Weddings and the City’s Principal Planner, Tiffany Ratliff and the BH&L team…Kelly, Carrie and Christina) was to help organize the sponsors and come up with a simple design concept. In addition, I am honored that I was able to donate my photography services (alongside another amazing photographer, Richard Israel…his images are coming soon!). I captured and focused on the details early on in the event, while Richard focused on capturing the latter half so that I could spend time with my little twinkies. It was perfect! 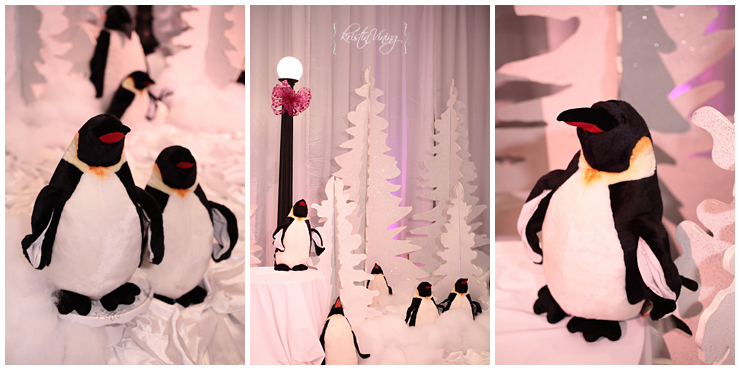 Extravaganza Depot stepped in and helped us create a Winter Wonderful stage, full of snow, trees and penguins! Scott Brown Media set the mood by piping and draping the entire perimeter of the room and then softening the space with pink highlights. 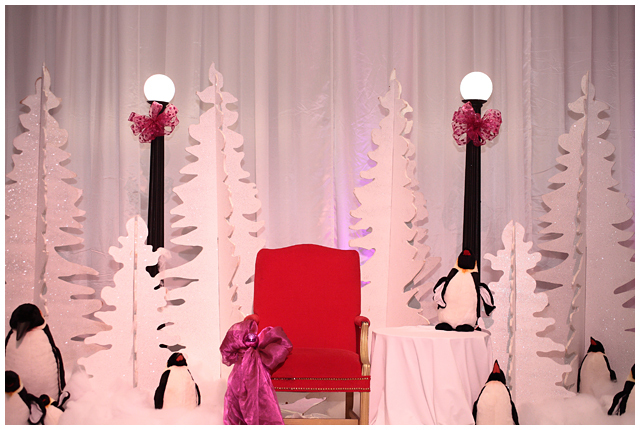 Party Reflections allowed us to sit-n-style on their wintery-white, Chivari chairs! Party Tables added that oh-so-important touch of pink linen. Thanks to, Split Second Sound and DJ LeVer for the jammin’ holiday tunes. Lindsey Regan Thorne dolled up all of our little girls with holiday face painting. Carolina Photo Booths graciously offered amazing photo favors. And I cannot forget to thank, Anne Neilsen…she is the amazing artist who inspired Miss Ellie to paint her spirit and soul on canvas! Fox News Rising & WCNC…THANK YOU for helping to get the word out! For those of you just tuning in, Amy’s Caringbridge journal is one to be read. It will change your life. I know it has mine. To see all of Sunday’s images (by KVP) visit, Pictage!! Ice Sensations absolutely stole the show with the “Tea for Two” ice carving table. Yep folks…a princess table and chairs made completely out of ice!! Crawford and Company’s crystal trees were one of the highlights of the afternoon. Utterly gorgeous! Amazing candy bar by, All You Can Treat! Small bites by, Ballantyne Hotel and Lodge’s catering team. The guest of honor…Team Potvin!!! Angel Ellie, Grace and Mom. Simply beautiful. Mrs. Amy Potvin…working tirelessly to change the face of pediatric cancer research. 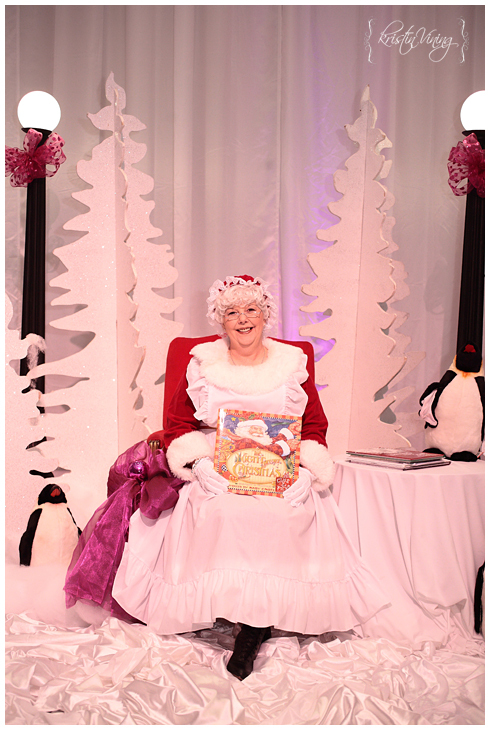 ‘Twas the Night Before Christmas story time with Mrs. Claus! And I decided to save the best for last…Tiffany Ratliff, “Thank you!” You are not only an amazingly talented wedding and event planner, but I’m so happy to call you my sister friend. Your kindness, generosity and time commitment to this event (and all of Weddings and the City’s events) is unparalleled. You are an amazing soul and spirit. I love you! “Happy Birthday to my husband! !” Birthdays in our home consist of cupcakes or birthday cake for breakfast…in this case German Chocolate (his fav!). Thank you, Love for sharing your special day with Angel Ellie, her family and the Lift Up Foundation! Oh my little buddy is all about hugs and kisses lately!! Good thing we love candid photos in our home…we are never looking at the camera at the same time. Thanks, Grandma Judy for capturing this!! Happy Holidays to you and all those you love! Ms.claus - Thank You for sharing! You have an amazing talent! You have certainly captured my “more gentle” side! Ms.claus - Thank You for sharing! You have an amazing talent! You definetly captured my “gentle side”! I will certainly tell Santa how good you have been and to EXTRA nice to you!